Mahan is peaking at the right time as he looks for his first-career major championship victory, and has played well at Augusta National in years past. But there are some other big-name players lurking out there who are also peaking at the right time. Tiger Woods and Rory McIlroy, the two favorites to win the 2012 Masters on betting odds available at Bovada Sportsbook won in the month of March as well. 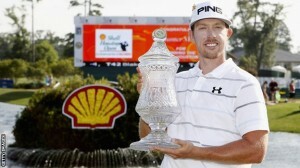 But Mahan is yet another example of players stepping up in 2012, to make for one of the most-compelling Masters in recent history. Thanks to a third-round 65, Mahan shot up the leaderboard to pull within two shots of the 54-hole lead. And on Sunday, he fired a 1-under par round of 71 on day in which anything in red number was superb. The scoring conditions were very difficult, and Mahan proved to be the one who could deal with it the best at the top. So I don’t know about you guys, but I’m fired up for the Masters this season, even more so than usual. Tiger is back, Rory is making his case, and some of the other players on the cusp of becoming great are knocking hard on the door. Mahan is one of those pounding on that door, and has jumped up the 2012 Masters Betting Odds into the top-six, now set at 25/1 to win the green jacket. You can bet that he will get a lot of people looking at him this week coming off of a victory, as the is the premium in terms of confidence coming into a major championship.